In the past, breathability and protection was mutually exclusive. The simple truth was that if you chose to wear armour, you were just going to have to put up with being a hot and sweaty mess. And while it may not seem like a big deal (particularly for those in cooler climates), the problem with poorly ventilated protection wear is that excessive sweat build-up can cause some serious chafing issues. And that can turn a knee pad into a torture device that feels like it’s made of sandpaper. 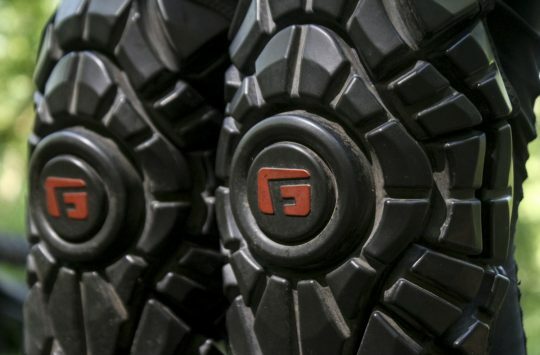 Thankfully for trail riders, the latest generation of lightweight pads have placed a renewed focus on breathability. 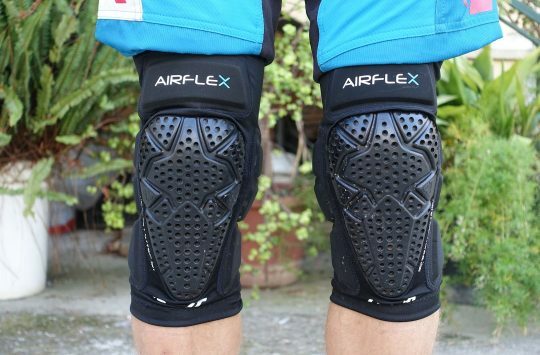 And for the most part, most of the knee pads we tested were all pretty good in this regard. However, there was one noticeable standout – the Dainese Trail Skins 2. 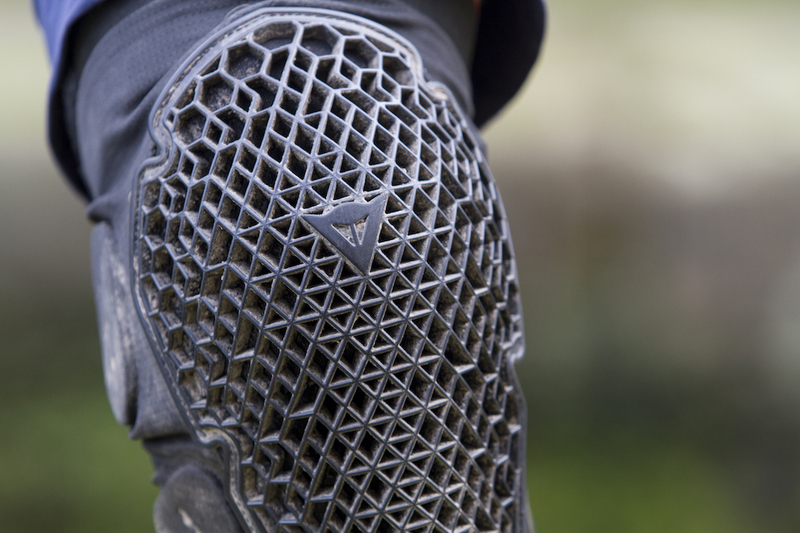 Dainese updates the Trail Skins knee pads with the (wait for it…) Trail Skins 2. “The successor to the highly-acclaimed Trail Skins, the second-generation again sets the benchmark for breathability, ergonomics and protection. Delivering the ultimate blend of mobility and protection, the low-profile design delivers unrestricted pedaling and all-day comfort while still meeting European standards for impact protectors. Additional side padding bolsters protection against the most common crashes and dual micro-adjustable elastic bands ensure a customized fit for every rider” – From Dainese. 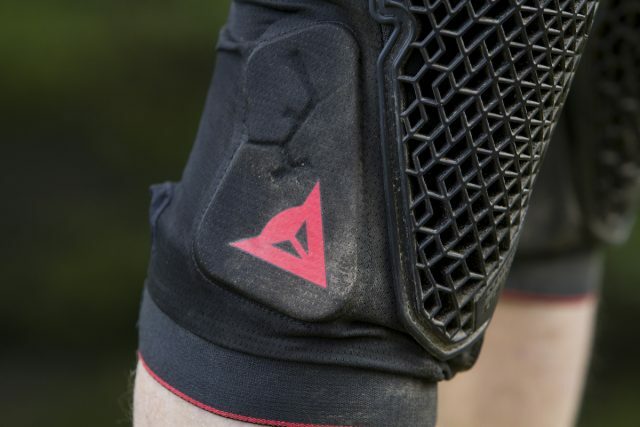 The Trail Skins 2 knee pads use a stretch mesh fabric for the core sleeve, with padding built into and onto that sleeve. 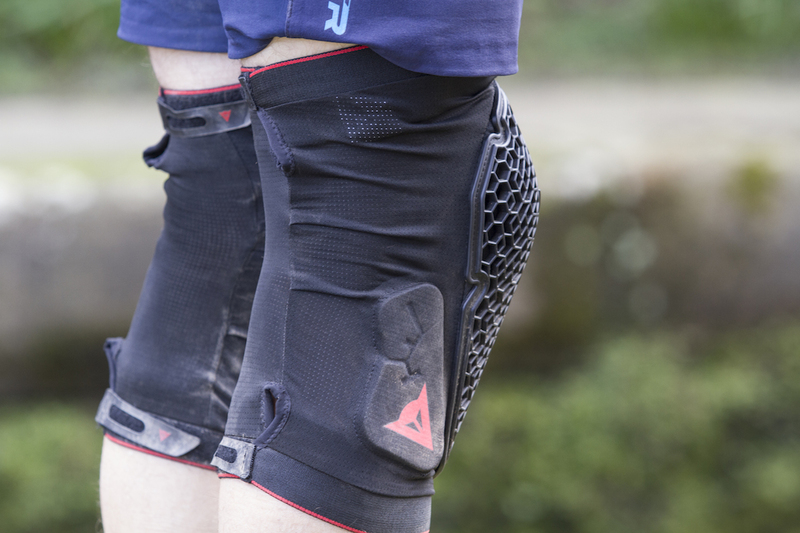 The Trail Skins 2 knee pads are the lightest option from Dainese, and designed to cover XC, trail riding and enduro racing. After several years away from mountain biking, Dainese has returned to the spotlight with a new range of riding apparel and body armour. The Italian company is famous for its rich motorcycling heritage, having pioneered numerous technological advancements in rider safety, including its distinctive lobster-tail spine protectors. After reigniting its MTB division just a couple of years ago, Dainese is once again looking to showcase its protection expertise, this time with slimmer and more ergonomic protective wear. Dainese has used Pro-Armour on the Trail Skins 2 knee pads to offer breathability, flexibility and impact absorption in one. 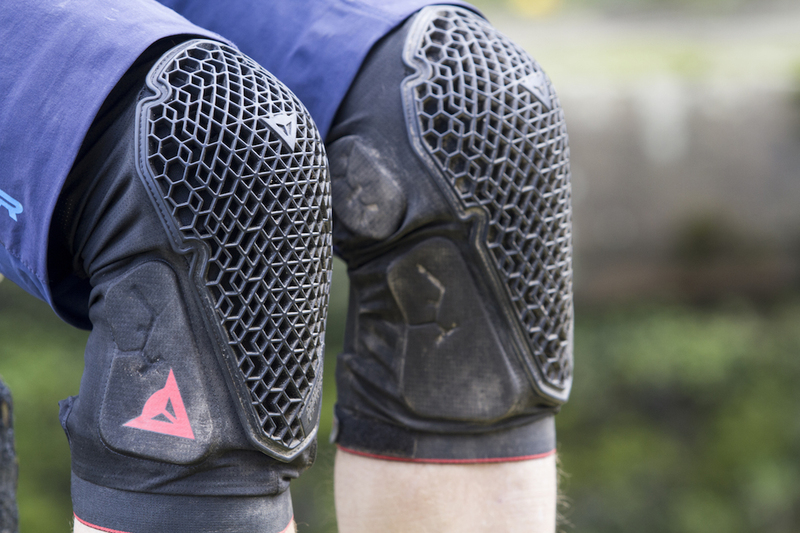 The Trail Skins 2 is the lightest knee pad that Dainese offers, and it’s ideally suited to cross-country and trail riding. Superseding the already-popular Trail Skins pads, Dainese wanted to boost protection levels, while simultaneously improving ventilation and comfort. To do this, Dainese introduced its Pro-Armor technology. Also found in the Rhyolite jacket and motorcycle protective wear, Pro-Armor is an instantly recognisable latticework structure that’s built from shock-absorbing rubber. During an impact the Pro-Armor shield deforms as it compresses, which helps distribute impact forces throughout the lattice. 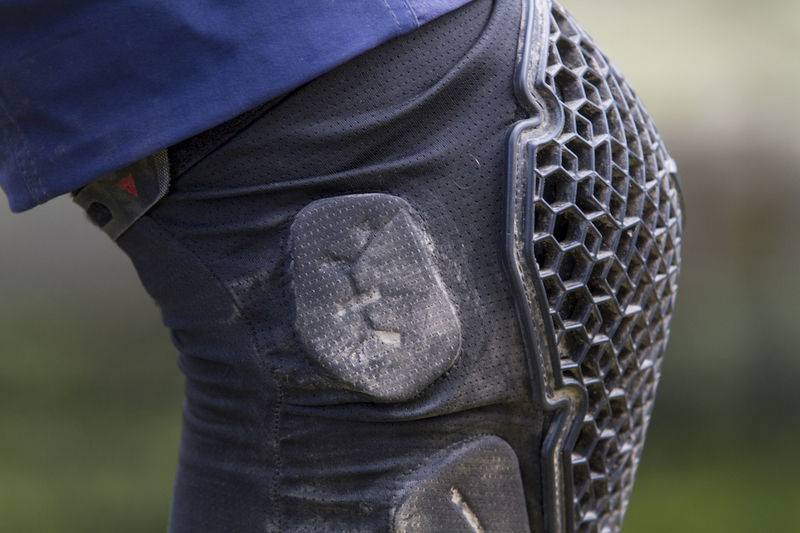 The protective plate is heavily articulated around the knee for a comfortable and flexible fit. What Pro-Armor also achieves is instantly noticeable as soon as you slip them on. With the fractal-shape construction, the whole amour plate is basically covered in hundreds of small ventilation holes. The result is masses of air flow over your knees. In fact, I actually found them too brisk to use on really cold days. And that has never happened with knee pads before. The Trail Skins 2 pads are available in Small, Medium and Large sizes, and they’re constructed around a thin mesh sleeve that slips straight on with ease. The sleeve uses an adjustable cinch strap at the top around the thigh, and at the bottom around the calf. Along with internal silicone grippers, this creates a secure fit. Two thin velcro straps sit at the top and bottom of each pad. However, testers with slender knees noted that the Pro-Armor plate can shift around more than they liked, which can be an issue in a sliding crash. In that scenario, all the additional edges created by the Pro-Armor plate also means there’s more chance of it grabbing the ground and potentially ripping the pad off it they’re not on super tight. Another quirk of the Pro-Armor plate is that it’ll store mud like honeycomb stores honey, so they’ll need extra attention after wet and muddy rides. 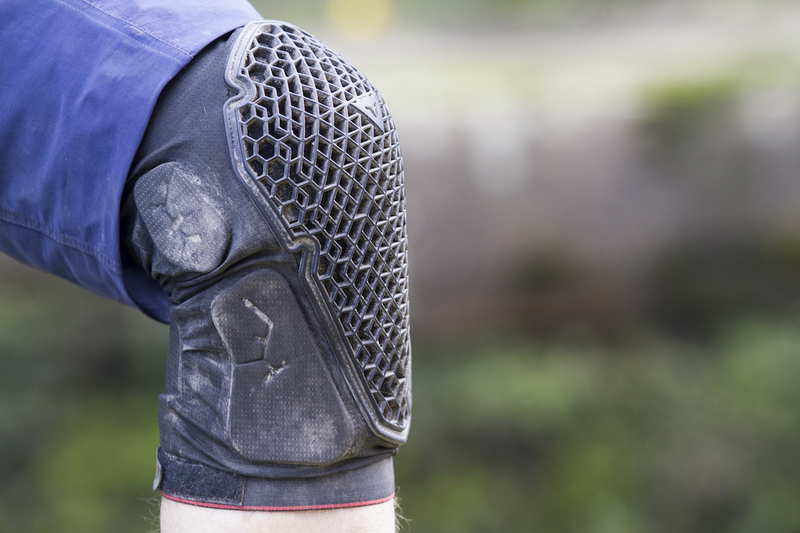 Additional EVA foam pads are used on the inside and outside of each knee for extra protection. The takeaway from that is to make sure you pay close attention to sizing. Ideally though, we’d like to see Dainese provide more sizing options to get that Goldilocks feel, and possibly some kind of fabric cover over the top of the Pro-Armor plate. 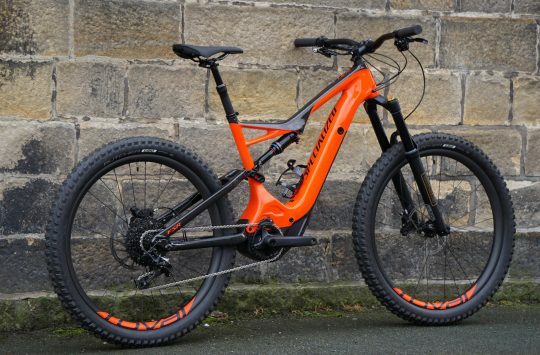 Of course, this would lessen the excellent breathability of the Trail Skins 2, so it’s swings and roundabouts. Otherwise the Trail Skins 2 are a highly comfortable knee pad that is really well articulated around the kneecap, with no obvious pinch zones even as you bend your leg. In the event of a blunt impact, they offer excellent protection too, and Dainese must be commended for adding in extra padding for the side of the knee, with crash absorbent memory foam panels sewn into both sides of the sleeve. Being rated to EN safety standards, there’s a little extra peace of mind there. 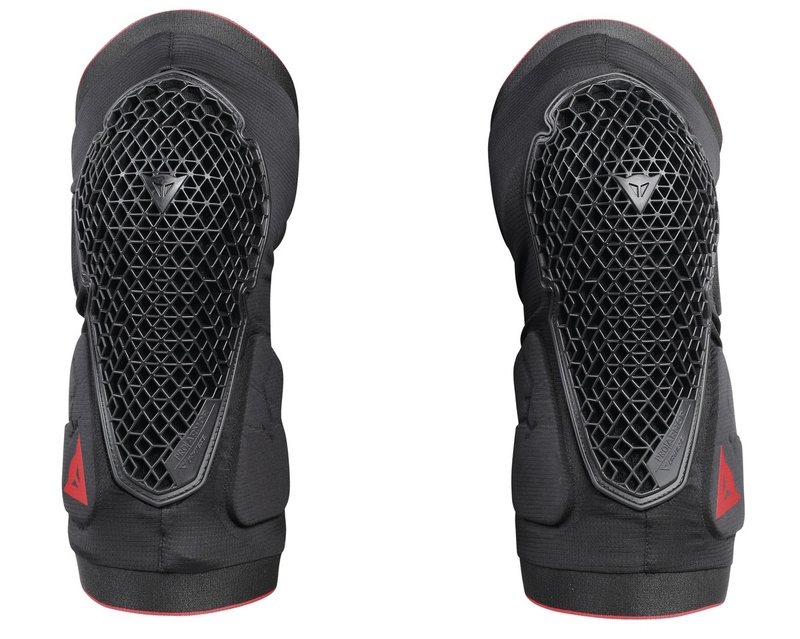 The Trail Skins 2 knee pads are highly breathable and well articulated. Just watch the sizing. An extremely breathable, lightweight and highly comfortable set of pads. Take care on sizing, and bear in mind the mesh fabric construction isn’t the toughest, but the highly protective and well-articulated Pro-Armor plate more than makes up for it. If you’re not a fan of having your knee caps stewed in their own juices on warm days in the saddle, the Dainese Trail Skins 2 knee pads will keep be a (literal) breath of fresh air.